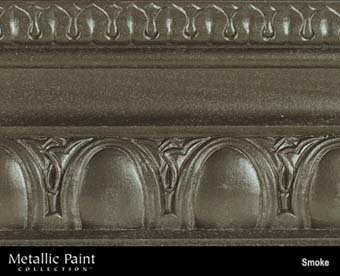 Paint Colors :: MANUFACTURERS :: MODERN MASTERS :: Metallic Paint Collection :: MODERN MASTERS METALLIC PAINT 24301 ME-243 SMOKE NT SIZE:1 GALLON. MINWAX 61500 WOOD CONDITIONER SIZE:QUART. RUSTOLEUM 00275 K7779402 GLOSS BLACK PROFESSIONAL LOW VOC SIZE:1 GALLON. VARATHANE 12798 211688 NATURAL 203 OIL STAIN SIZE:QUART.